The 5070 is our entry level model, but by no means lacking in power, speed or endurance with a 24/7 working capacity. 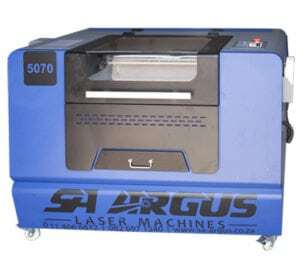 Equipped with a 70W laser source, it is ideal for cutting and engraving on a wide variety of materials in small production lot sizes. If you still want all the benefits of a 70W, but do not need to do items much larger than an A2 (with room to spare) – this mini beast is for you! Perfect for industries such as scrapbooking, corporate gifts, fashion & jewellery and even the events industry. Engrave and mark glass & crystal with your SA ARGUS.